Yesterday morning, I dropped Ryan and his best friend, Christian, off at the airport to fly to their starting point for their trek on the Appalachian Trail. They flew into DC and got to walk around and see a few sights before hopping on a train to Harper’s Ferry! They’re about to go on the adventure of a lifetime and hike 2200 miles in five months. It’s going to be awesome. To document this incredible experience, Ryan started a super awesome blog and I totally encourage you all to check it out. 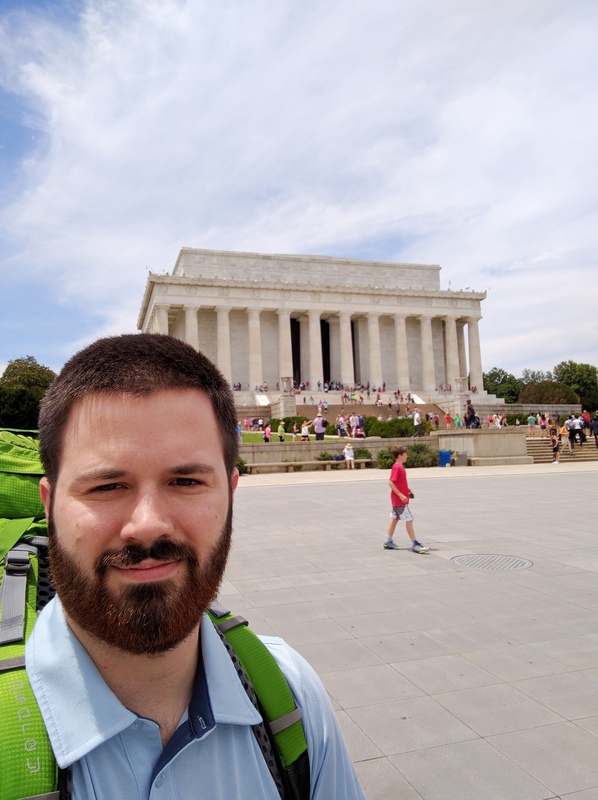 He’s only been gone for one day, but his photo map already has some really cool pictures and I can’t wait to hear more about his experience on the trail. Go check it out! 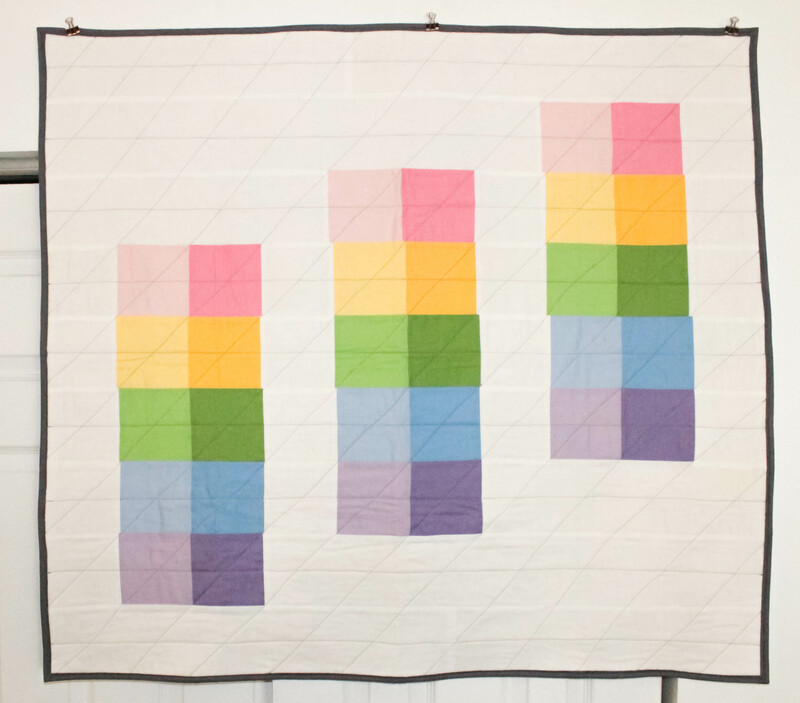 Today, the Orlando Modern Quilt Guild had a sew day at the Dr. Phillips library. It was a full house and the Orlando Sentinel was there to document our efforts to wrap our community in love and support with our beautiful rainbow quilts! Check out the video below to get a glimpse into the sew day and hear from one of our members about our goal! Orlando Modern Quilt Guild gathered at the Southwest Branch Library on Saturday, June 18, 2016, to begin a project to cover those affected by the Pulse shooting with quilts made from rainbow hearts and love. As you’ve probably heard, there was a terrible shooting at Pulse nightclub here in Orlando last weekend that took the lives of 49 people and injured 53 others. I’m still trying to figure out my own reaction to it – I’m heartbroken, I’m traumatized, I’m angry, and I’ve been processing a lot of emotions over the past week. I’ve been keeping busy doing what I can to reach out and help those who have been affected. I’m filled with hope and warmth as I look out and see several hour waits at blood banks, trucks full of water and juice and food being unloaded at places like The Center and the Zebra Coalition for anyone who needs it, and our community coming together to help each other get through it. 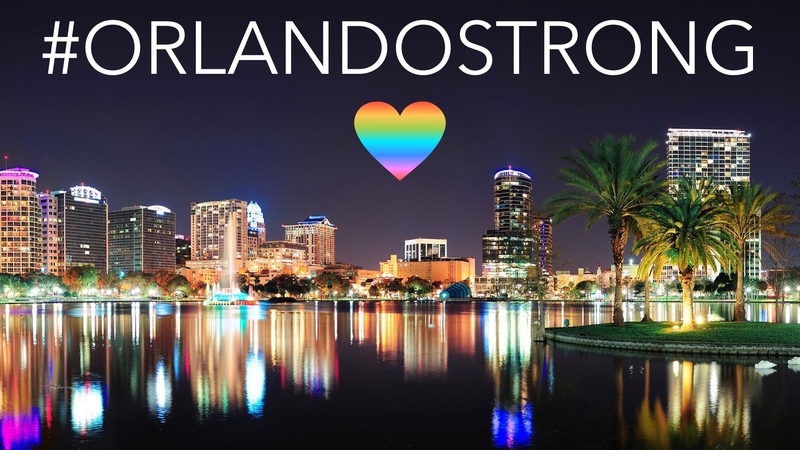 Orlando is a weird, hot, sometimes annoying, beautiful, diverse, and loving city and it breaks my heart that something like this has happened here. The Orlando Modern Quilt Guild has set a goal to give quilts to the victims’ families, the survivors, and the first responders to the scene. It’s a huge undertaking, and we’ve already got so much support from all over! 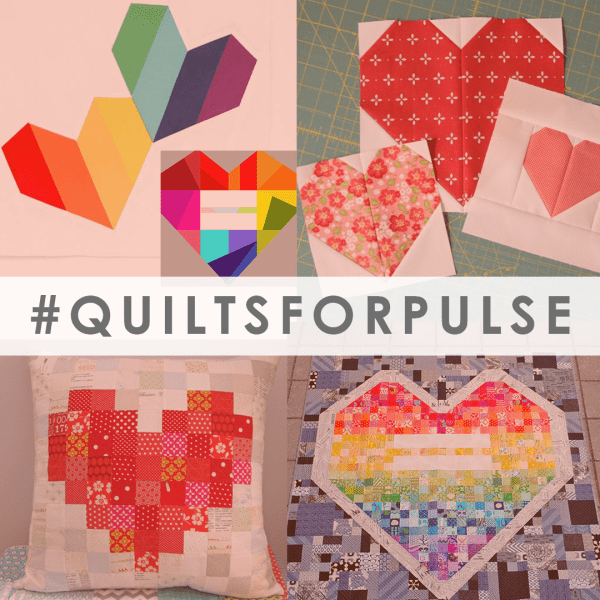 Major companies are donating supplies, quilters are sharing patterns on their blogs, and #QuiltsForPulse is taking over Instagram. We can use all of the help we can get, so if you’d like more information, please check out our website to see how you can contribute! 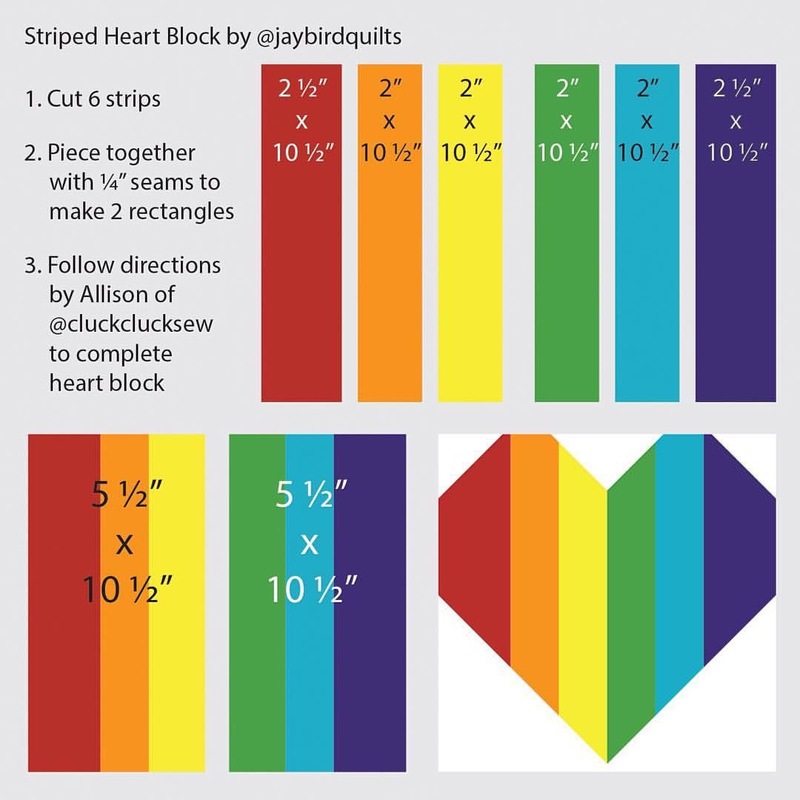 Below you can find links to free patterns, tutorials, collection sites, and other resources to help you get involved in the #QuiltsForPulse movement. You can also find some supplies (most of which I’ll probably be using!) on Amazon that are easily available if you don’t feel like trolling through a fabric store for the perfect fabric for a few hours (but why wouldn’t you want that?!). This list will be updated as more information becomes available! Colorful Fabric Jelly Rolls — great for making binding! I seriously cannot say enough about how much it means to me and our whole guild that so many people are reaching out and getting involved in the #QuiltsForPulse movement. We’ve had major companies offer supplies and we’ve had tiny guilds send pictures of all the blocks they made at a sew day together. Your support truly means the world to me, and to the guild as well. Thank you so much — now go get quilting! This is the headline we should be seeing about Brock Turner’s recent outrageous sentence to only six months in county jail and three years of probation for his brutal assault on an unconscious woman in 2015. Instead, we are seeing headlines and articles touting Turner as a promising Stanford Swimmer, an easygoing guy, a smart kid with a bright future who merely made a “mistake” one night. A mistake. Sexually assaulting a woman behind a dumpster was merely a mistake. A temporary lapse in judgement. A minor transgression that should be forgiven and forgotten. Except that it isn’t that simple. Brock Turner’s assault on his victim may be a mistake, but that does not give him or anyone else the right to justify his actions. Brock Turner must still pay for his mistake, just like everyone else. Brock Turner’s smiling, clean, professional photo has been plastered all over these articles, citing his pre-Olympian swimming statistics and ignoring the fact that Brock Turner’s one “mistake” has altered the life of his victim in a way that cannot be undone. Brock Turner is a criminal, and he does not deserve the respect of these positive photographic representations of himself. Ask yourself this: when a verdict or sentence is reached in other brutal crimes and is then reported in the media, what photograph is used to represent the perpetrator? The mug shot. The dirty, emotional, raw, honest portrait of the criminal. That is what should have been used to represent Brock Turner in all of the reports on this case. That is what we use to represent criminals. Brock Turner got off easy. Unlike most others who commit heinous crimes like his, Brock Turner will be released and will have the opportunity to work on himself and improve his life. I can’t say I agree with the disgustingly lenient sentencing, but I hope for the sake of everyone that he can accept responsibility for his actions and use this rare opportunity to improve himself. The father of the convicted wrote a long letter to the judge to spew on about Brock Turner’s character, his academic and athletic achievements, and how this “twenty minutes of action” has changed his life forever. This does not excuse his terrible actions against the victim. Brock Turner’s past does not entitle him to leniency. The victim in this case has suffered over a year of trauma, reliving the night of the attack and will have to endure this trauma for the rest of her life. She has years and years of post-traumatic stress, therapy, nightmares, and more to look forward to. She has been given a life sentence to suffer through for Brock Turner’s crime against her. And we’re hearing about his swimming times? His GPA? His achievements? This is unacceptable. Brock Turner may be white, he may be smart, he may be athletic, he may be young, he may have attended Stanford — but these things are not relevant. These things do not excuse his crime. Here’s what is relevant: Brock Turner is a criminal convicted of sexual assault. I’ve been in a massive slump since graduating with my bachelor’s degree about a month ago. I’m not sure why. I graduated without any real plans or direction, but a clear understanding of what my goals and passions are. I’ve had a creative block, which is frustrating, as I’ve been desperately trying to relieve some of this slump stress with a project, but it just hasn’t been happening. Throughout college, I didn’t have a career in mind. If we’re being totally honest, my main goal in life is to be happily married and raise some wonderful children — which is funny, because I’ve always been pretty independently ambitious. I still am independently ambitious. But I feel that my life goal is to achieve that family life. One of my biggest dreams is to host a holiday for family members (extended and immediate) at my house and just have a grand old time. But the point is, I started college without a clear career in mind and ended it in the same way. Luckily, I am not completely clueless. I know that I have a passion for serving others, especially those who are going through a rough time or who need help. This passion has led me to my volunteering at Crisis Text Line as a crisis counselor — a job that certainly can cause stress — and finding that working in these situations gives me so much life. I don’t even know how else to describe it. When I am helping others in such dire situations, I feel alive. And I think that’s something to be considered when it comes to choosing a long-term career. So after stressing about what I was going to do with this bachelor’s degree and how I was going to pay the bills and eventually contribute to this family dream of mine, I started applying for jobs. Despite now having obtained this degree I found myself feeling unqualified for almost everything I came across, but I applied to jobs that I felt I could either excel at and be happy in, or that I felt would feed that passion to serve others. One of those applications happened to be for a 911 telecommunications specialist position — a 911 operator. I had actually thought about being a 911 operator for quite some time but wanted to finish school before making any sort of full-time, long-term commitment. Well, two weeks after filling out the application, I received an email letting me know that I was a candidate and should come in and take the CritiCall test, which is a public safety telecommunications exam. It’s kind of like a preliminary qualification exam; it weeds out the people without the basic skills necessary to work in this field. This morning, I took that test at the local sheriff’s department office. I was nervous and excited and so, so nervous! I had almost a week to think about it and spent the whole time being pumped up about it and worrying about all the different aspects of the test. Would I be able to type VINs fast enough? Can I multitask as well as I think I can? Do I even know how to read a map? I finished this test in about an hour, and when the test administrator informed the recruiter that I had finished, she was pretty sure that I had probably just failed the test — most people take at least an hour and a half to take it. She printed out my results and came in to talk with me about them and the next steps in the hiring process. She seemed totally blown away at the fact that not only had I finished the test in an hour, but I managed to completely surpass the minimum typing speed required by 1500 kph and earn the highest score she had ever seen. I got a 99% on this exam. The minimum requirement to move forward is a 76%. She was very impressed, and I tried to contain the part of me that wanted to cry with excitement while still letting her know that I was happy and excited and totally into this idea. She told me about the next steps in the hiring process, how she thinks I’d be a great fit, and how after two years I can move around into any other part of the sheriff’s department, mentioning specifically their Victim Advocacy program, which happens to be another career I’ve been considering. It was such a positive experience for me. It seems so silly, and in the grand scheme of things, this test means so little. But after a month of feeling very down in the dumps and like I had no direction, this made me feel a lot better about myself and my future. The hiring process is going to be long, but I am excited and confident about it. Here’s to the future, y’all. We can do it.